assesses contact centers according to such criteria as company growth, sales growth and contact volume and published a ranking of the world’s most successful companies every year. From 2 – 5 November 2010, the “5th Top Ranking Performers Conference” took place in Las Vegas, during which the “Top Outsourcer Awards” were presented. For the third year running, Competence Call Center is awarded this prize and is thus one of the best call centers in the world. In the category “Blended Contact Center Services”, CCC scored points with regard to quality and quantity and convinced the jury with consistent performance and outstanding services. “The Top Outsourcer Ranking is an informative resource for clients looking for thebest in the outsourcing industry”, says Raj Wadhwani, president of ContactCenterWorld.com. “The award is given to companies who offer outstanding services and lends global recognition. The outsourcers on this list have successfully undergone arigorous judging process and have been assessed according to many different categories. For the third year running, Competence Call Center has impressed the expert jury with its competence, high quality level and enormous growth”. The jury at the Top Outsourcer Awards assesses contact centers according to such criteria as company growth, sales growth and contact volume and published a ranking of the world’s most successful companies every year. “The Top Outsourcer Award represents another, independent confirmation of our competence and quality.Thanks to the great commitment of our staff, we are one of the winners in international competitions”, says a happy Christian Legat, COO, Competence Call Center. “For 12 years we have been measuring ourselves against the best in the industry. This international award, which is our 30th, shows the success of our constant benchmarking efforts”. Competence Call Center has recently successfully completed the certification audit for EN 15838 and has been awarded this European call center standard. “For partners and potential clients with their rising performance requirements, this Europe-wide standard is an independent proof of our high service quality. It also lays the foundations for future success and awards”, says Legat. 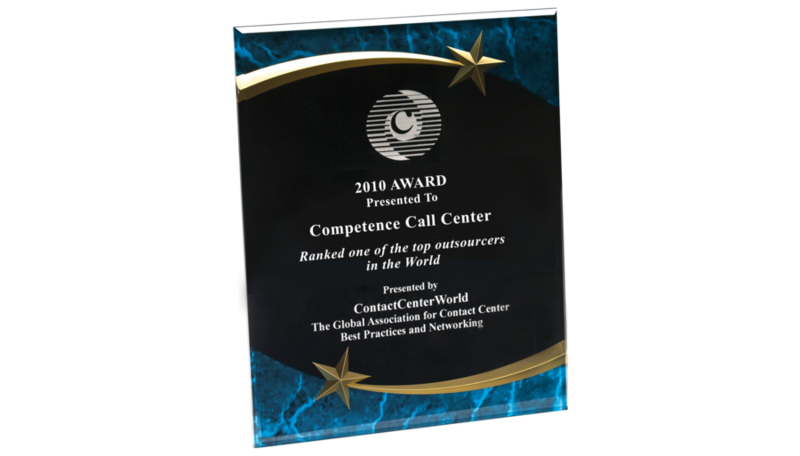 Competence Call Center is one of the leading call centers in Europe and has been offering high qualityinternational call center services for 12 years. More than 2500 service professionals at 9 locations in 6 countries have demonstrated “competence” with more than 100 million telephone calls. 30 internationalawards confirm the quality standards of the company’s incoming hotlines, outgoing campaigns and written customer communication.